Costa Rica is a breathtaking blend of lush nature, beach parties and impressive volcanoes. This destination is becoming more and more popular among tourists from all horizons for very good reasons. However, travelling from one end of the country can be difficult, and tourist activities are still being developed in Costa Rica. This is exactly why we have put together this guide on where to stay in Costa Rica! Written by our team of expert travellers, this guide will tell you all about the best areas to stay in Costa Rica, and where you should be going depending on your activity preferences. After reading this article, YOU will be an expert on where to stay in Costa Rica, whether you are heading there with friends, family or on a budget. P.S While you’re in research mode, our insider guide to the 17 best hotels in Costa Rica is designed to help you find an amazing hotel (at a price you’ll love!). Plus, with the help of our epic guide of the 24 best things to do in Costa Rica, you’ll find something to do to suit your taste, no matter your budget! Are you looking for a hotel specifically? We have got you covered! These are our highest recommendations for places to stay in Costa Rica. Nested in the jungle, La Chosa del Manglar Nature Retreat is the best budget hotel in Costa Rica. Every room is fitted with a porch or a private terrace and has a private bathroom. Beds at the nature retreat are simple and comfortable, and bed linens and towels are provided. Free WiFi is available all around the property. Casitas Tenorio B&B is located in a lush exotic garden in the Volcano Tenorio National Park. All rooms are equipped with a private bathroom and a private terrace overlooking the garden. A fridge and a tea and coffee maker are available at Casitas Tenorio B&B. Sloths, monkeys and toucans live on the property. If you are looking for a modern and luxurious home away from home, Kura Design Villas is the best place for you to stay in Costa Rica. Located near the beach in Uvita, it boasts magnificent views over the Pacific Ocean and an outdoor infinity swimming pool. Costa Rica is a very diverse country and you’ll need the help of a complete guide to help you find the perfect holiday for YOU! Costa Rica has a mountainous spine that makes it difficult to cross the country from the Caribbean to the Pacific coast. Choosing the right place to stay is thus paramount if you want to avoid hour-long drives or flying every other day. As we are dealing with a country, neighbourhoods are actually whole cities, and there are a lot of national parks. Before deciding on where to stay in Costa Rica, it is important to figure out what type of activity you will want to indulge in first. The country is very diverse and can be a dream come true for beach lovers, jungle explorers, volcano seekers, party goers, surfers and more. The capital of Costa Rica is San Jose and is pretty much located in the middle of the country. Even though it is often overlooked, the city is still worth a visit and has a few hidden treasures to show if you dig a bit deeper. In the North, volcanoes, hot springs and deep jungles are most common. It is a great area for adventure seekers and nature lovers. As a bonus, everything is accessible to families and the younger ones. The Caribbean coast has a lot to offer: white sand beaches, lush exotic jungles, incredible wildlife vibrant nightlife spots. Puerto Viejo is a backpackers and digital nomads’ favourite. The Pacific coast is not left out, as what is known as the Costa Ballena, between Dominical and Ojochal, is quickly becoming the hottest spot to visit in the country. That may seem like a lot to take in right now (and there is indeed a lot to see in Costa Rica! ), but read on and you will become an expert on where to stay in Costa Rica! It is now time to take a closer look at the best neighbourhoods and areas to stay in Costa Rica. Each one of them has something different to offer, as well as a different vibe. Which are you in the mood for? Manuel Antonio is our best choice for where to stay in Costa Rica for the first time. Manuel Antonio is actually the name of a very small National Park located on the Pacific Coast of Costa Rica. However, it is also the most visited in the country and the perfect place to stay if you are visiting Costa Rica for the first time. The park is easily accessible, even for families, and can be hiked in a day. Although it is small in size, its wildlife is absolutely stunning and you can expect to encounter sloths, snakes, monkeys, racoons, spiders and much more. White sand beaches with crystal clear waters are also located in or near the park, setting the perfect scene for a relaxing day in the sun. Water activities like parasailing and catamaran sailing are available and on top of the thrill they bring, offer a unique viewpoint on the national park and its coastal rainforest. A great number of hotels and resorts can be found in the area, making it easy to just unwind for a few days – or a few weeks! Hotel Mimos is an affordable boutique hotel and the best budget hotel in Manuel Antonio. Guests can relax by the side of its two outdoor swimming pools located in lush tropical gardens. The rooms at Hotel Mimos are spacious, clean, and fitted with comfortable beds. They all feature a private bathroom and air conditioning. Located just a 5-minute drive away from the Manuel Antonio National Park, Hotel Plaza Yara is the best mid-range hotel in Manuel Antonio. The Hotel Plaza Yara rooms are spacious and include a kitchenette and a seating area. From the balcony, you will be able to spot sloths, toucans, monkeys and more! Los Altos Resort is the perfect home away from home in Manuel Antonio! All the suites are spacious, equipped with a full kitchen and dining area, as well as a private bathroom. The largest ones can accommodate up to 8 people. A delicious breakfast is included with the rooms and served in the in-house restaurant at Los Altos Resort. Corcovado National Park is exactly where you need to go if you are looking for the backpacking experience of a lifetime. Many travellers coming back from there compared it to what they had seen in the deepest areas of the Amazon jungle or the primary rainforests found in Malaysia and Indonesia. Located on the southern Pacific coast of Coast Rica, Corcovado National Park is easily accessible by plane with domestic airlines from San José. It is said that 5% of the world’s biodiversity is located in Costa Rica, and at least half of that is encountered in Corcovado National Park. Be prepared to be amazed by the wildlife and fauna you will run into while your hike! All fitness levels can be accommodated, as short walks and several-days-long trails are available. The park is accessible from several points of entry depending on what you are looking to do. Corcovado National Park can be reached via a dirt road, or with a boat ride that, during the season, will allow you to spot dolphins and humpback whales. It provides plenty of camping and backpacking accommodation options and is thus the best area to stay in Costa Rica on a budget. Cabinas Tropicales Puerto Jimenez is the best budget hotel in Corcovado National Park. All rooms are comfortable and include air conditioning, a private bathroom and a garden view. Bikes are available for free at Cabinas Tropicales Puerto Jimenez, and there is a barbecue area. A free WiFi connection is also provided. La Leona Eco Lodge offers mid-range accommodation near the Corcovado National Park. Rooms are fitted with a private outdoor bathroom and free toiletries. The decoration is rustic and inspired by jungle cabins. The resort does not provide electricity in the private rooms and uses candles instead. Luna Lodge is an incredible nature retreat in the middle of the jungle. The resort boasts an outdoor swimming pool, yoga classes, spa treatments and a free wifi connection. All rooms at Luna Lodge feature a private bathroom with hot water, free toiletries, and a private terrace with a sea view. Lately, Puerto Viejo has developed as a hub for digital nomads and backpackers in Costa Rica. It is easy to understand, as the area has some of the most beautiful white sand beaches in the country. As a consequence, nightlife has really developed around Puerto Viejo, and some of the best clubs in Costa Rica are located there. The city boasts a vibrant atmosphere all year-round. The Puerto Viejo area is also home to the BriBri indigenous community. Some of them have opened to the public and are willing to let visitors take a peek into their culture and way of living. Cocoa crops are also widespread around Puerto Viejo, and chocolate tours teach tourists about how cocoa is grown and turned into chocolate. You can also sample some of the chocolate made on the farm! From January to March, Puerto Viejo turns into a great surfing spot, with a swell that can become quite impressive for beginners. On the other hand, September and October are the best months to snorkel the amazing coral reefs and hang out with tropical fish and turtles. Caribe Town is the best budget hotel in Puerto Viejo. Within the hotel grounds, guests can enjoy a saltwater swimming pool, exotic gardens and a bar located inside the swimming pool. Suites, bungalows and houses are available at Caribe Town and are all fitted with a private bathroom and a terrace with a garden view. Cariblue Beach Hotel and Jungle Resort is the best mid-range hotel in Puerto Viejo. All the spacious rooms are equipped with air conditioning, a private bathroom and a terrace overlooking the hotel gardens. A Costa Rican breakfast is served every day at Cariblue and guests can enjoy free coffee all day long. Le Cameleon Hotel is a boutique hotel located near the beach in Puerto Viejo. The hotel offers a private beach club, a spa offering massages and a beautiful outdoor swimming pool. Rooms at Le Cameleon are decorated with a white modern decor and feature a private bathroom, air conditioning and a flat-screen TV. Located on the Caribbean coast, Tortuguero National Park is one of the most beautiful nature reserves in Costa Rica. As it is one of the rainiest parts of the country, the biodiversity is particularly developed. As a consequence, Tortuguero National Park is home to thousands of species of fauna and flora, including migratory and resident birds such as hawks, falcons, and owls that can easily be spotted. 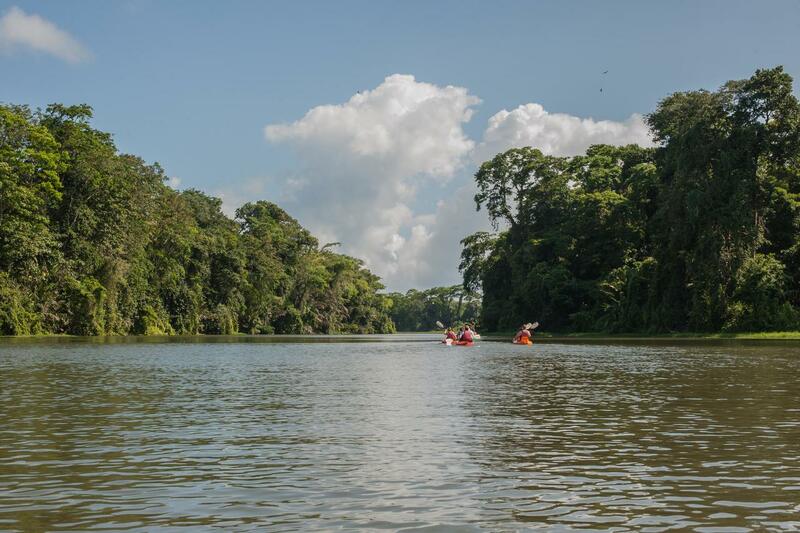 The park has no roads so taking a boat will be the only way of exploring the rainforest and spotting its inhabitants. Alternatively, active visitors can go on a kayaking or canoeing outing to look around from a unique perspective. However, the main reason why people flock to Tortuguero National Park is, as suggested even in the name of the place, the turtles. Between March and October, four species of turtles (green turtle, leatherback, hawksbill and loggerhead) come and nest on the beach at Tortuguero National Park. Specific turtle tours are organised by local guides during the nesting season. Waters and beaches are not suitable for swimming in the national park, but visitors may enjoy looking at crocodiles, and sharks instead. In a nutshell, if you are planning to visit Tortuguero National Park, do not forget to pack your binoculars and be prepared to be amazed! Cabinas Icaco Tortuguero is tour top choice when it comes to where to stay in Tortuguero National Park on a budget. The hotel is located directly near the beach and offers great views over the Caribbean Sea from the common terrace. Turtles can also be spotted nesting nearby Cabinas Icaco Tortuguero. The comfortable rooms feature a fan and a shower. Caribbean Paradise Eco-Lodge offers spacious and comfortable rooms featuring a private bathroom and a balcony with either a garden or a river view. Bed linens and fans are also included. The eco lodge has an outdoor swimming pool and a restaurant, and provides a free Wifi access. Massage services are also available. Tortuga Lodge and Gardens is a gem located on a riverbank in the heart of Tortuguero National Park. All rooms are fitted with comfortable beds, screened windows, a fan and a private bathroom. The resort also boasts a stunning outdoor pool, a fusion restaurant and a free WiFi connection. The Arenal Volcano is the most famous volcano in Costa Rica. Until recently, it was also the country’s most active volcanos but it has seen a decrease in activity. The volcano’s almost perfect symmetrical shape is breathtaking to see from all angles, and its surrounding offer tons of activities for the whole family to enjoy. When volcanic activity is down, visitors can hike the Arenal volcano and cross lava fields. Some trails also offer a stunning viewpoint on to the Arenal volcano and Arenal Lake. Trails are relatively short and accessible to families with children. Arenal Lake, a man-made water reserve created to produce hydroelectric power, offers lots of water activities such as waterskiing, windsurfing, sailing and stand up paddle. For thrill seekers, canyoning, zip lining from the canopy and hanging bridges will get you higher than ever before. And while you are there, take a minute to spot the incredible wildlife: birds, snakes, monkeys and more. Finally, a visit to Arenal Volcano National Park would probably not be complete without a relaxing time at the natural hot springs. Many hotels and resorts have their own springs and sell day passes for people who do not stay there. Arenal Lodge is our top pick for where to stay in Arenal Volcano National Park on a budget. The lodge is located in the middle of the rainforest and it is common to spot birds, wild mammals and tropical vegetation. Family rooms which can accommodate up to 5 people are available and include a private bathroom. Arenal Observatory Lodge offers stunning views over the Arenal volcano and boasts a privatised area of the rainforest featuring a lake. The rooms at the lodge are fitted with a private bathroom with a bathtub, a fan and a terrace with garden views. In the resort, families will enjoy an outdoor swimming pool and a game room. Tabacon Thermal Resorts boasts its own private hot springs, a spa offering relaxing massages and beauty treatments and no less than 5 swimming pools. Rooms, including family rooms, feature a private bathroom and air conditioning. This makes the resort an obvious choice on where to stay in Arenal Volcano National Park! Costa Rica is a diverse country that surely has a lot to offer to its visitors, whether they come with kids, seek the thrill of water sports or are looking for a laid-back town by the beach. Wildlife and flora is incredibly diverse and unique in Costa Rica, setting up the scene for the trip of a lifetime. The Pacific coast has stolen our hearts with its incredible nature and stunning white sand beaches. There, Kura Design Villas are our top choice for where to stay in Costa Rica. With magnificent views and luxurious rooms, it is truly a relaxing home away from home. Do you have more places to see on your bucket list? Can we tempt you with our local guide to 15 awesome things to do in Bermuda?! Plus, while you’re there, our neighborhood guide to where to stay and the best hotels for your time on the wondrous island will help you save money and stress! Have we missed one of your favourite spots in Costa Rica? Let us know in the comments and we will make sure to add it to the list!